Within the first minute into this album, I knew I was going to love it. I have listened to Masters of Space and Time from the beginning to the end, multiple times at this point. While I try to listen to every album I review many times, I found myself putting this on for non-writing purposes, just because I wanted to hear it. Gypsy Chief Goliath has been around for a while, but this was my first introduction to them, and it has been quite the indoctrination. Destroying, in the best way, my favorite genre of music, G.C.G. has already become a new favorite of mine. In fact, I liked it so much, and I went to iTunes and downloaded every previous album available on there. Rocking Canadians out of Windsor, Ontario, Gypsy Chief Goliath includes members; Al “the Yeti” Bones (vocals, guitar), Adam Saitti (drums), Darren Brush (bass), Dustin Black (guitar), Mark Calcott (keyboard), and John Serio (guitar). As I was listening to some of their older music, I noticed a shift in musical composition. Here is the thing, their older music is absolutely incredible. It is gritty, fuzzy, sludgy, all the stoner rock you can throw together into some epically constructed songs. This, by no means, takes away from Masters of Space and Time. If anything, it shows how incredibly diverse this band can be, and how with every shift, it is still done astonishingly well. 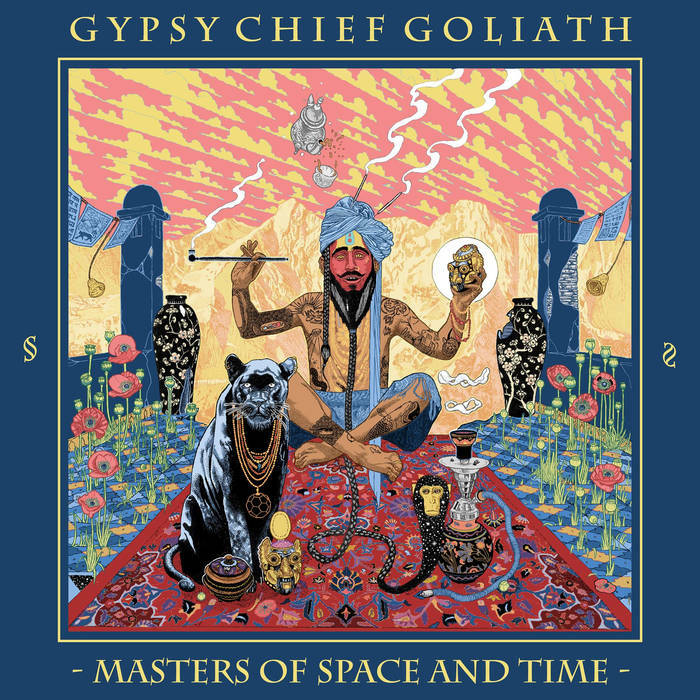 While the older music shows off the stoner rock foundations, Masters of Space and Time incorporates a classic rock. Keyboards and vocals straight out of the 60’s, which was exciting to hear coming from newer music. The arrangement of a classic rock sound with a stoner rock overtone was exactly what I didn’t know I needed in my musical assortment. The album is under an hour all the way through, with eight songs in total. Every song is as good as its predecessor and the next. “City of Ghosts,” kicks off the album with a Deep Purple feel. The keyboard rings out along with the groovy riff, and Bones’ vocals are as classic as classic rock ever was. The chorus breaks into an even catchier riff just to switch into a slower more stoner rock feel. I have loved this song from the first listen, and it is definitely my favorite on this album. “Highway Man” is a bit more haunting. The riffs are just as catchy, Saitti’s drumming plays exactly what the song needs, and Bones’ vocals are a bit grittier in places. I keep wanting to listen to this song closer and closer to hear what it is about. It sounds like they are telling a great story of this highway man, but I keep getting so lost in the music, I will lose my focus on the lyrics and just enjoy the ride it takes me on. “Low Cost of Living High” again sounds right out of the 60’s. The beginning riff will have you convinced you have time-warped. Every instrument comes together perfectly and compliments one another to create an unbelievable track. “Into the Sun”, tied with the last song as my second favorite. It has a bit of a Clutch feel with keyboards. This song is impossible to sit still to. It will have you belting out “into to suuuuunnnn”. Bones’ vocals are much rougher on this track, but as with everything they do, it is performed beautifully. The album ends with the title track, which is a near nine-minute song. It starts off bluesy and southern rockish. I felt it in my soul right from the beginning. The music draws you in and holds you hostage. This song has a Black Sabbath feel, from the vocals, to the riffs, to the overall arrangement. It is just a fantastic song. Masters of Space and Time is gem. If you like classic rock, blues, stoner rock, doomish metal, and just all around incredible music, I suggest you check this album out. If you love it as much as I do, I would also suggest checking out the rest of their impressive catalog as well. They are diverse, talented, deliver well composed music, and give your soul something special. The mixture of three epic riffage guitars, groovy bass lines, incredible drum beats, haunting keyboards, and vocals that range from song to song, converge into an album that is unforgettable.